"We shall fight on the seas and oceans, we shall fight with growing strength in the air"
Despite an uneasy alliance between Stalin and Churchill, British airmen found much in common with their Soviet counterparts in Murmansk. When Germany invaded the Soviet Union on June 22, 1941, Josef Stalin found an ally in one man who had never been shy of denouncing him. In a radio address that day, Winston Churchill expressed his sympathy for the Soviet people, declaring that although: “No one has been a more consistent opponent of Communism than I…Any man or State who fights against Nazism will have our aid.” So began four years of military co-operation between wary partners that played a vital part in winning the war in Europe. The first order of business for these new allies was ensuring Soviet forces a regular stream of supplies and raw materials. The Trans-Iranian Railway was suggested as an ideal way to move equipment north through the Middle East, but, the Shah of Iran had long held German sympathies and Iran had become the Nazi’s largest trading partner; the Shah even keeping a signed photograph of Hitler. He refused requests to use the railway and Iran responded by holding pro-German rallies. On Aug. 25, 1941, the Soviet Union and the United Kingdom launched Operation Countenance, with Soviet forces invading Iran from the north while British troops entered from the south. Within a month Iran was occupied, its Shah deposed and a vital supply line into the Soviet Union secured. More than five million tons of supplies eventually passed over this route. From the start Churchill was also keen to make use of Britain’s large and powerful navy to help supply Stalin. In addition to the supply route through Iran, convoys were readied to ferry equipment from Britain through a northern, Arctic route to Murmansk and Archangelsk. This was no simple task, as the convoys had to pass through Nazi-controlled waters and past occupied Norway. In addition to the ever-present threat from the enemy, the environment itself presented an enormous challenge. Those travelling in the winter months had to navigate in darkness, while those travelling in the Arctic summer were extremely visible and often exposed to sustained and co-ordinated attacks from warships, U-boats and the Luftwaffe. It was vital these convoys got through, as not only did they deliver tanks and aircraft for use by the Soviets, they also provided everyday supplies essential to the war effort, including items as mundane as telephone wire and, over the course of the conflict, 15 million pairs of boots. Additionally, the first of these convoys carried a very special cargo indeed. By Sept. 1, 1941, 550 pilots and ground crew from No. 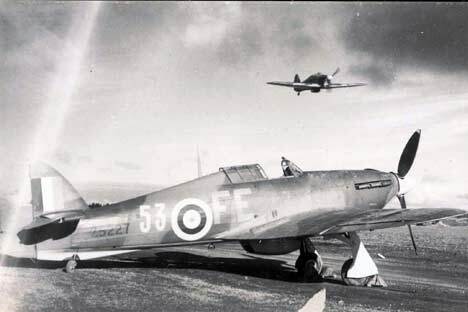 151 Wing of the RAF had arrived in Murmansk with 40 Hawker Hurricane fighter planes. Their objective was to provide immediate air defense against the Axis forces who had launched Operation Silver Fox in the hope of capturing this vital port. They were also there to train Soviet pilots to operate the first of what would eventually total almost 3,000 Hurricanes. Tim Elkington, 90, a veteran of the Battle of Britain, was among the pilots who took the voyage and he found that, unlike their politicians, Soviet and British pilots held a mutual appreciation for one another and formed an effective working relationship. “Everybody was very friendly indeed, there was no silence or distrust,” Elkington said. “They were very keen to learn and work with us. I think in some ways they were far more experienced than we were, and were considerably older than we were. The boss, Safanov, was exceptionally good.” Boris Safonov, a Russian ace who flew planes supplied by the British, particularly enjoyed the Hawker Hurricane. For their efforts, four pilots in 151 Wing became the only Britons in the war to receive The Order of Lenin, among them the Wing Commander, Henry Ramsbottom-Isherwood. But the voyage home proved as difficult as anything they faced in the air. The Arctic winter brought thick ice, while spray from the sea would freeze on the deck of the ships in great quantities. “We were stuck in the ice for three days,” said Elkington. “You'd move a few meters and the ice would freeze again. It was so thick you had to watch out for stowaways, they'd walk across the ice [from land] and let themselves in! In spite of the bitter winters and risk of attack, Britain continued to send supply convoys until May 1945. Some 1,400 vessels delivered 5,000 tanks, 7,000 aircraft and four million tons of vital supplies. The human cost of the convoys reflects the risk involved. Over 100 vessels were lost. Belfast’s own sister ship, HMS Edinburgh, was sunk by enemy action near Murmansk, while Safonov himself, after being awarded the title of Hero of the Soviet Union, died while defending one of these convoys from German attack. Nevertheless, both sides were dogged in their defense of these convoys, and when Stalin asked for assistance, Churchill provided it. By 1945, nearly a quarter of all aid sent to the Soviet Union arrived by these Arctic convoys. The war in the east may well have been very different without them. Tim Elkington, 90, was among the pilots of No. 151 Wing, part of a unique venture that saw a whole Royal Air Force Wing, ground crew and all, shipped to northern Russia in the early days of the war in the Soviet Union. The No. 151 Wing provided air support for the Soviets and also vital instruction in how to operate the Hawker Hurricane fighters that later Britain later supplied. On Sept. 1, 1941, Elkington and his comrades reached Murmansk. While some Hurricanes arrived in crates, others took off from the aircraft carrier HMS Argus. Before even touching down in Russia, Tim faced the challenge of taking off from a deck only 143 meters long. Although Soviet and British leaders distrusted one another, when it came to getting down to business, the servicemen of both nations were able to form an effective relationship built on mutual appreciation. “Everybody was very friendly indeed, there was no silence or distrust,” said Elkington. “They were very keen to learn and work with us. I think in some ways they were more experienced than we were, and were considerably older than we were. The boss, [Boris] Safanov, was exceptionally good.” Safanov, who enjoyed flying the Hurricane, became the first Soviet ace to claim 30 kills, but was shot down within a year, defending a British convoy. The author would like to thank Air Commodore Philip Wilkinson for providing the images of Hurricanes and their pilots working in the USSR in 1941.